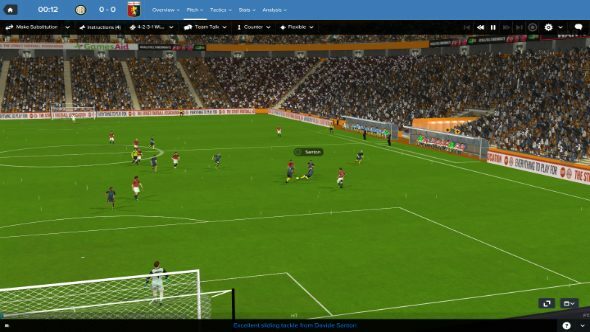 All (alright, most of… ok, some of) the best things in life are free of charge, and that’s no different in Football Manager. For bargain hunters and managers who enjoy taking over at cash-strapped clubs, bringing in an experienced head or a talented youngster on a free can inject quality into the first team or bulk up the squad at little cost. But if you want to sign someone without dipping into your transfer budget, who should you be going for? We have lined up a starting eleven of top free transfers to help you snap up a star without upsetting your in-game finance team. Related: the best PC simulation games. Just because a player is going for nothing does not mean they cannot be an asset to your first eleven. Some players will be reaching the end of their contracts and fancy a new club and others might have not just worked in their previous manager’s system. 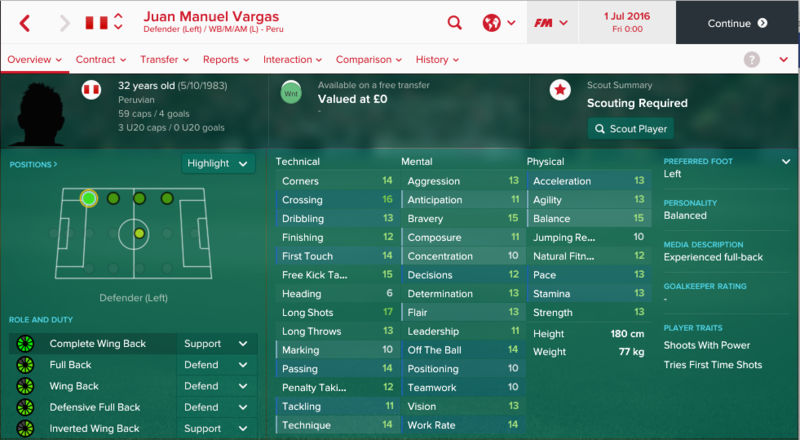 Either way, these are the FM 2017 free transfers you should be signing up. Amelia is a solid, if unremarkable, keeper. The experienced Italian lacks stats above 15 for everything except jumping reach and tendency to punch, meaning that he won’t cut the mustard at any top European sides. 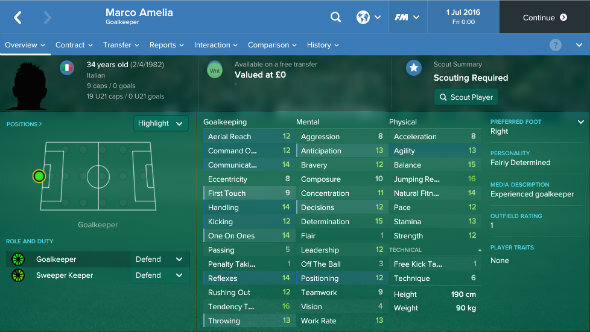 But with a series of 14s and 13s across the board in the likes of handling, reflexes and communication, Amelia could do a job for a lower league side or a side in the top flight of a weaker European league. And if you’re managing a bigger side in need of a backup or third-choice keeper, he could be an option as he isn’t likely to complain if he does spend a lot of time out of the starting eleven. The ex-Roma man is a good choice at right back for managers operating in leagues such as Portugal. Still pretty quick, technically adept and an excellent crosser of the ball, he’s certainly capable of adding an attacking dimension to a number of sides. However, the decline of his physicals (and particularly his stamina) means that it is unlikely that Maicon can do his defensive and attacking work equally well. So if you do sign the Brazilian up, consider playing him as a wing back to the right of a back three and stationing a central midfielder with a defend duty on his side of the pitch. That should help give you enough cover at the back when he romps down the pitch with the ball. What a strange and frustrating career the former Barcelona and Juve man has had. Almost always impressive, almost never a first team regular. Whatever the particulars of Caceres’ real-life career, his stats are still world class at the start of FM 2017, with the player fresh from a five-year spell at the dominant Old Lady. If you play him on the right, don’t try to push him into a role where he’ll be bombing up the wing and whipping in crosses – that’s not where his strengths lie. Rather, with heading, marking, tackling, positioning, work rate, balance, and strength stats all around 15-16, he can make an attacker’s life very difficult for 90 minutes. By picking him up at 29 you’ll be getting Caceres at his peak, and in doing so slotting in an instant first team regular to your squad, regardless of what level you play at. 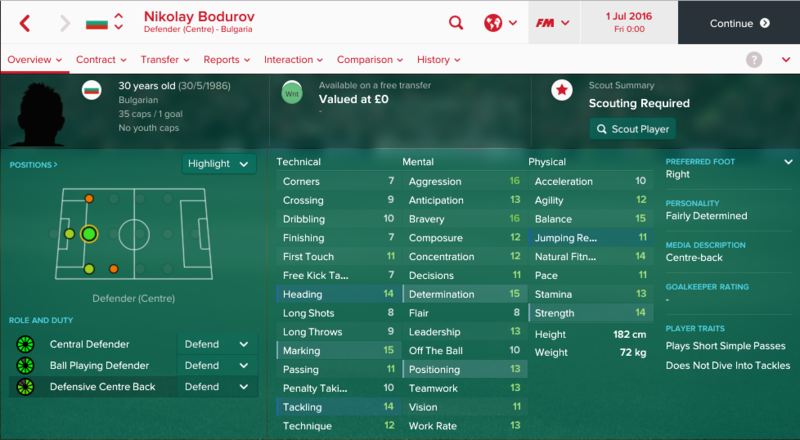 Lower league managers seeking a centre back would do well to snap up Nikolay Bodurov. The Bulgarian CB’s best position is supposedly as a central defender on a defence duty. But if you play him as a defensive centre back, you’ll play better to his more limited strengths in the air and in the tackle. But to make sure you get the most from him, partner him with a quicker defender with slightly more composure. That way you’ll be able to make the most of his pretty powerful play. No, you’re not reading a guide about Championship Manager 01/02. 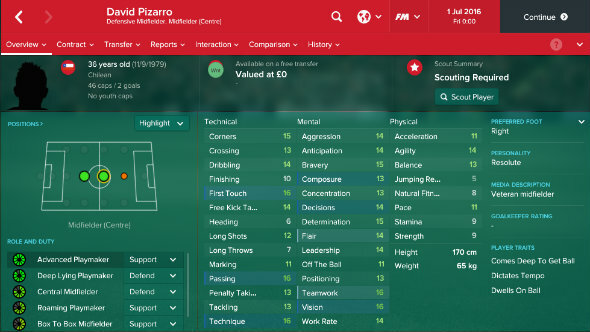 The eminent Frenchman was great as a youngster in Sports Interactive’s previous series, and he’s a great pick at centre back in FM 2017 all these years on. Now 34, the former Roma man and current Milan agitator has over a decade’s experience of top flight football and European competition. Strong heading, marking, and tackling stats all above 15 all reflect that. He does have a bit of a temper on him though, does Philippe. Maybe set his tackling to ‘normal’ at the highest, because if he gets booked once and argues with the officials – one of his displayed traits – you could both well be seeing red. If you need to add a bit of inspirational leadership to your side, Lorik Cana could be the man for you. The Albania captain is an aggressive, but technically adept, central defender with sky-high leadership stats. 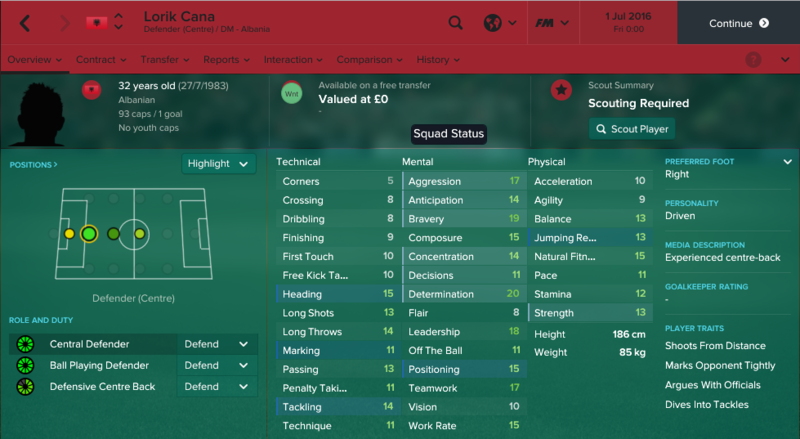 This means that Cana can easily step into, and begin leading, top-flight teams that need a figurehead to drag them through matches. The only weakness in Cana’s play is his temperament, which could lead to bookings. But as one of the few players genuinely capable of playing as a normal centre back or a ball player, his versatility and his age means he could be a solid investment for two – maybe three – seasons. Lacking a set piece specialist? Then why not try bringing Juan Manuel Vargas in on a free transfer. Capable of playing across the left side of midfield, but most comfortable at left back, Vargas is an interestingly dangerous player. 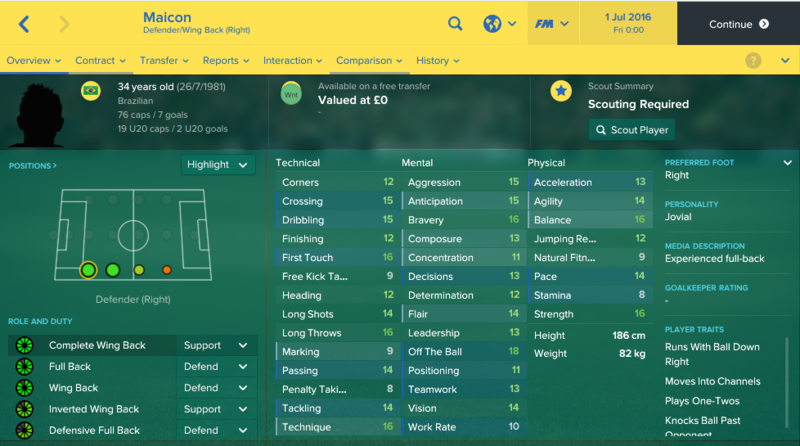 His excellent crossing stats make him a threat from deep and the byline, while his 15+ ratings for free kicks and corners means he can deliver threatening balls into the box. And as if that wasn’t enough, Vargas’s long shots rating of 17 means he has the ability to chip in with unexpected goals from all over the pitch. This makes him an excellent signing for anyone who needs a versatile attacking full back. No, not Simao, Simao. While the Portugal legend is probably a bit too old to be useful at 37, his namesake from Mozambique is a sprightly 27 by comparison and boasts impressive physical stats. Limited to a DMC role, Simao will nonetheless cover a lot of ground for you using his 18 stamina, 18 natural fitness and 18 work rate ratings. By comparison he’s a mediocre distributor of the ball with only a 12 passing rating, but his 15 marking and 15 tackling will keep opponents honest. 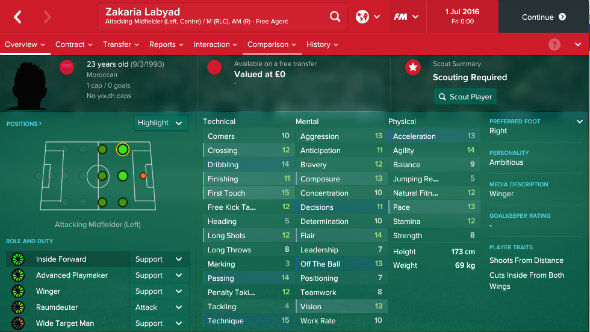 Best of all, at 27 he still has room to grow into his high potential stat (for those that like to see under the bonnet of FM using Genie Scout, FMRTE etc) so wheeler-dealer types (no offence, Mr Redknapp) canm turn a tidy profit on their intial outlay of, you know, nothing. 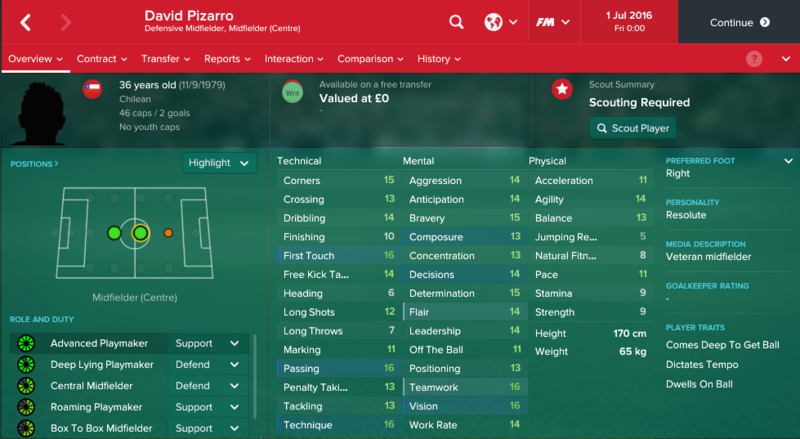 Despite his advanced years, Pizarro remains a genuinely top quality signing for anyone needing an experienced playmaker. 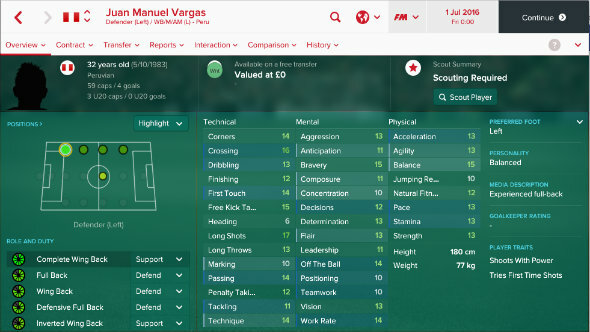 His 16+ ratings for passing, technique, first touch and vision means that he can still perform at the highest level as an advanced playmaker. But his declining stamina and low natural fitness means he does run the risk of running out of steam mid match. So if you want Pizarro to be a starter, make sure to partner him with a hard working midfielder to lessen his workload. Otherwise, he is a great option off the bench if you need to control a match late in the game. Muntari is a handy player for anyone seeking a disruptive influence in the centre of the midfield. In his favoured ball winning midfield role, Muntari’s excellent marking, tackling and positioning means he will win the ball back effectively for your side. And, as a left footer with a passing stat of 13, he’s also well placed to balance a central midfield pairing and ensure that you don’t lose the ball cheaply. But to make the most of Muntari’s particular set of skills, it’s important to partner him with a creative central midfielder. By playing Muntari with a playmaker, you can make sure that any balls he wins back can be quickly distributed back to your attacking players – ensuring his defensive work has an offensive pay-off. 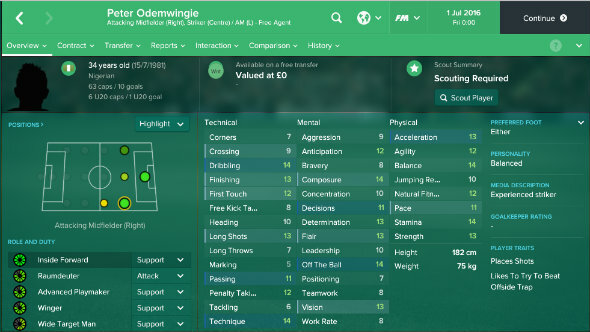 Provided that you can prise him from his parking space outside of QPR’s training ground, Peter Odemwingie could be a versatile attacking signing for a lower league or newly promoted top division team. For the most part, he is best suited to playing as an inside forward in the AMR slot. His decent finishing and composure stats, combined with his preference to break the offside trap, means Odemwingie is well placed to make intelligently timed (and dangerous) advances into the penalty area. But as he is also capable of playing as a central striker – either as a complete forward on support or as an advanced forward – the Nigerian could provide valuable flexibility for teams light on numbers. Labyad is the youngest player in this list, which means he isn’t the finished article. But for managers seeking a dynamic attacking player with room to improve, he could be an interesting signing. Playing as an inside forward on the left of the midfield, it makes sense to focus on improving the creative side of Labyad’s game. 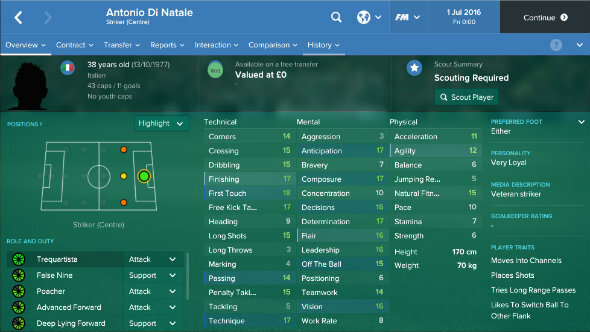 With decent passing, technique and vision, he has the potential to smartly play in teammates and even to become an advanced playmaker further down the line. But to turn him into a useful attacking outlet, you’ll need to make sure Labyad gets plenty of time on the pitch to hone his skills. Oh, and train him out of his long shots habit as soon as possible – he’s really not proficient enough to be hitting them regularly. The evergreen and enigmatic Bulgarian has been a bit of a hidden gem in the FM series for years now, but never more so than in the latest game, when he can be snapped up for absolutely nothing. Realistically you’ll get a season of good football from Berbers before his age has too much of a bearing over his already diminished physical stats, but with finishing, composure, first touch and tekkers ratings all above 15 he’s capable of converting chances on goal into product with consistency. Play balls to his feet, rather than his head, and watch him put them away. A great choice for backup striker, or starting striker in less competitive leagues and competitions. Also: it’s Dimitar Berbatov. At 38, Antonio Di Natale is comfortably the oldest player on this list. But despite that, we still heartily recommend signing the experienced Italian. The biggest reason why is that he most certainly still has it in front of goal. 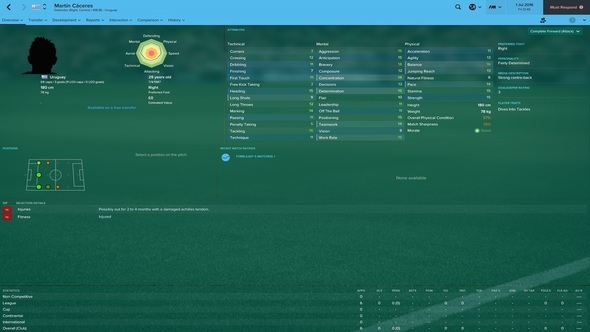 Though his physical stats are on the wane, the quality of his finishing, composure and technique means he is still one of the best goalscorers in FM. 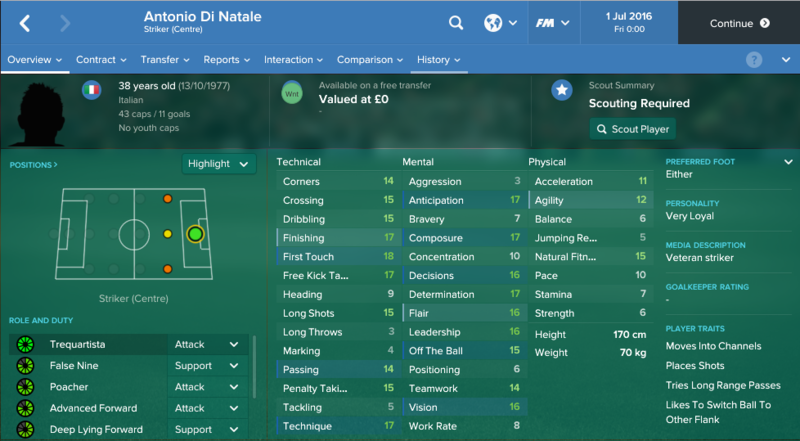 Furthermore, Di Natale is an excellent role model. 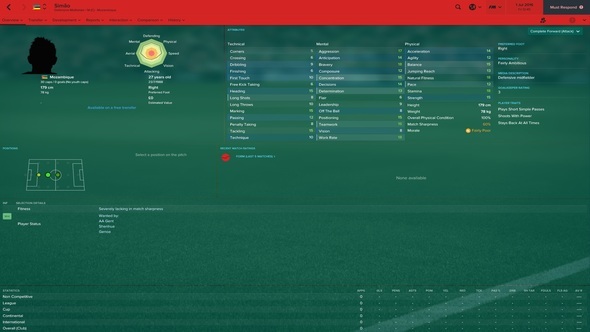 His overall skill, his personality type and his leadership stats make him a consummate professional – meaning any young centre forward could learn from him. The key to making the most of him then is to take his age into account. For managers seeking to start him, that means playing Di Natale sparingly and ensuring he doesn’t have to complete 90 minutes too often to keep him fresh. And for those using him as a backup, make sure to keep him fit so he can make an impact in the final 20 minutes of matches. It might not seem like much, but a player of his quality could be the secret to tucking away important chances at the end of big matches. What’s 190cm tall and built like a brick wall? 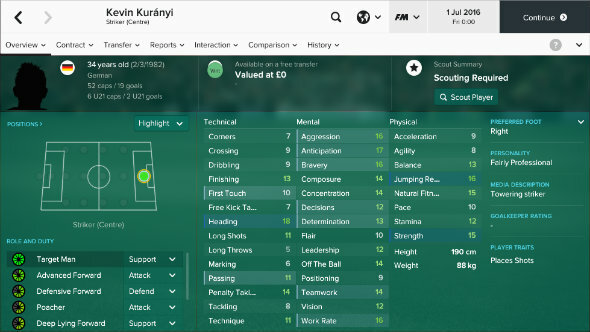 The answer is Kevin Kuranyi (or a 190cm tall actual brick wall…), and he is the perfect signing for any manager seeking a hard as nails target man. 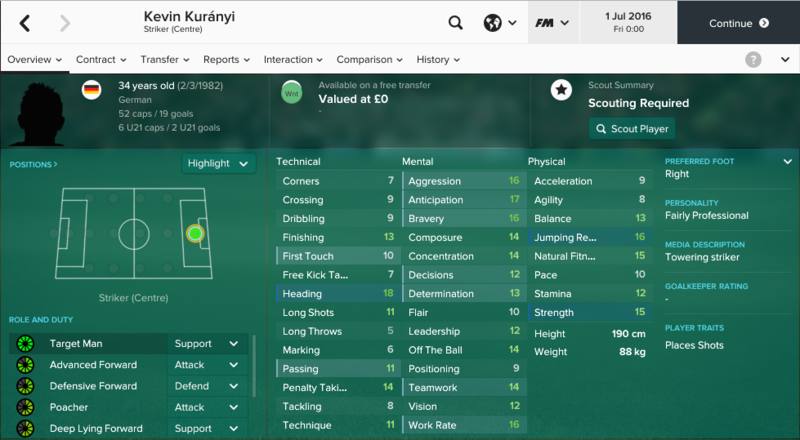 Aggressive, strong and excellent at heading, Kuranyi is your archetypal big man up top. Sure, he might not be the greatest player on the ball and he certainly won’t be playing cute through balls between the opposing defence. But if you need a focal point for your attack, it’s hard to look past the powerful German as an option. But to make the most out of his ability in the air, partner him up with a pacey poacher or place a goal scoring attacking midfielder just behind him in the midfield. This will help to make sure that there is always someone near him to take advantage of his knockdowns.